Banekin are small humanoid Daedra that often attack in groups. They use shock magic in combat. 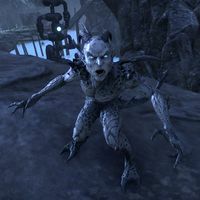 As they are considered Daedric creatures, banekin are especially vulnerable to Fighters Guild abilities. A basic melee attack that does minor shock damage. A charged melee attack that does moderate shock damage. This spell can be interrupted to set the enemy off balance. The enemy summons a ball of lightning above itself. This attack does moderate shock damage over time to all players near it as indicated by a red circle. This attack can be interrupted to set the enemy off balance. Following the completion of Castle of the Worm, a Banekin will appear and say: "You! Tharn wants to speak to you! Go to the Daggerfall/Vulkhel Guard/Davon's Watch Mages Guild! Quick quick!" Veteran Deadlands Banekin Slayer: Defeat 550 Banekin in Veteran City of Ash I. Veteran Banekin Slayer: Defeat 140 Banekin in Veteran Elden Hollow II. This page was last modified on 20 November 2018, at 01:59.